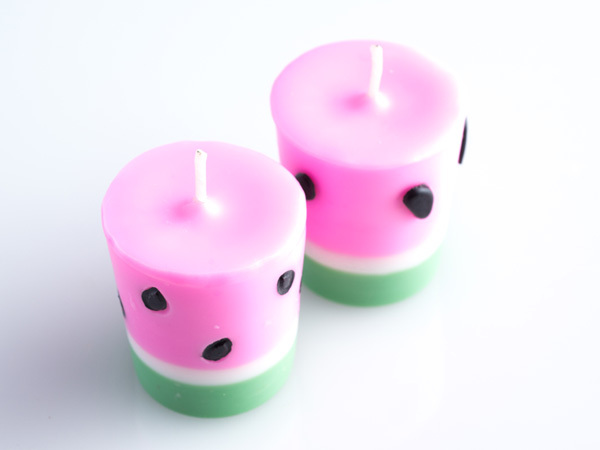 Votive candles are fun to make and we wanted to kick them up a notch by creating a scent specific design – watermelons! These are delightful to use for celebrating summer and will really show off your creativity. 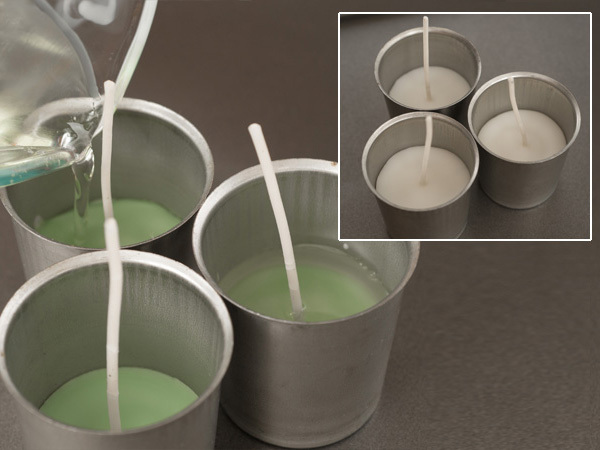 This candle making tutorial features layering. Cover counter with wax paper, old newspapers or aluminum foil to make clean up easier. 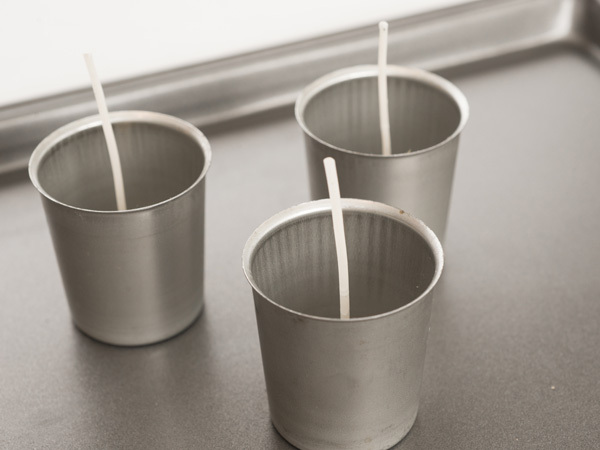 Prepare the votive molds by placing a pre-tabbed votive wick w/self-centering tab in each mold. Set these off to the side. 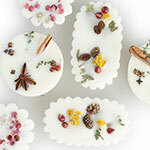 Tip: Place the votive molds on a cookie sheet to make moving them easier. Melt the wax with the chosen method. IE: presto pot, double boiler. 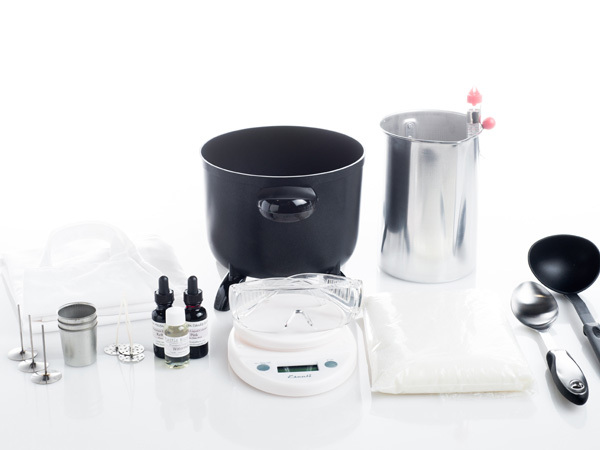 Make sure to follow the wax manufacturer’s melting & pouring guidelines for correct temperatures. 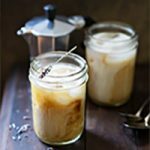 For this tutorial, KY Para-Soy Votive/Tart Blend** is being used so it will need to be heated to approx 165F per the manufacturer’s guidelines. Use a thermometer to correctly monitor the temperature. Set the pour pot on the digital scale and tare. Transfer needed amount of wax to pour pot — in this tutorial (3) watermelon votives will be created, so 7 oz* total of wax will be needed. Transfer 2 oz* of wax, and add .2 oz of Rustic Escentuals Watermelon Fragrance Oil for the first layer. Stir well (approx 2 min), then add 1 drop of Rustic Escentuals Kelly Green/Lime Liquid Premium Liquid Candle Colorant. 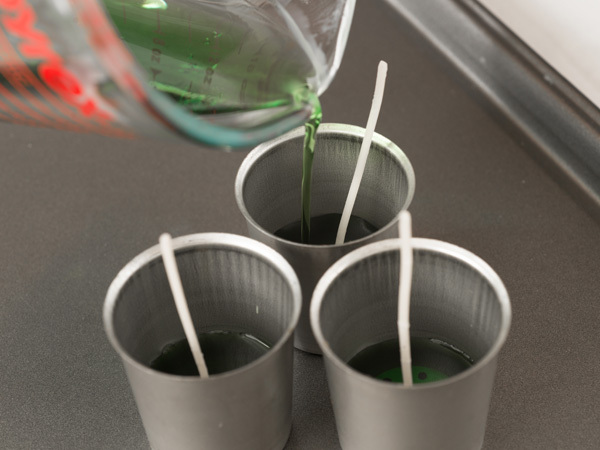 When mixture has cooled to approx 155-160° pour into votive molds. Fill the mold approximately 1/2”. 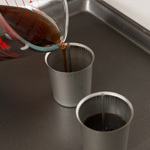 Once the first pour has cooled enough that it has stopped shrinking, it should look close to the below photo, prepare to pour the second layer. Set the pour pot on the digital scale and tare. 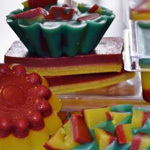 Transfer 1 oz* of wax, and add .1 oz of Rustic Escentuals Watermelon Fragrance Oil** for the second layer. 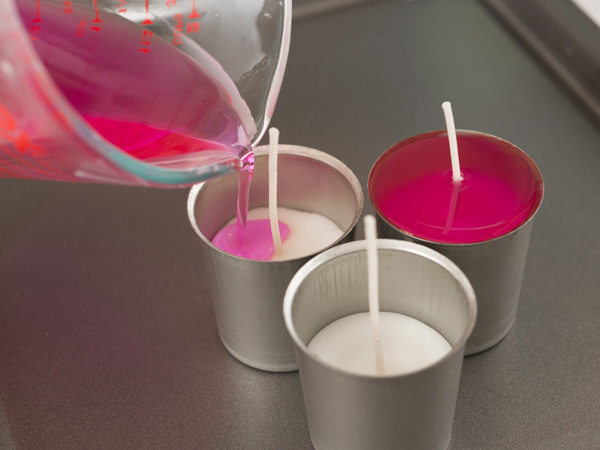 Stir well (approx 2 min), then add 1 drop of Rustic Escentuals Pink Liquid Candle Colorant. Stir well. 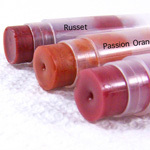 If you want your votives to have more of a red tone, dip a bamboo skewer into a bottle of Rustic Escentuals Red Liquid Candle Colorant and stir into the melted wax – this will add a deeper color to the votive candles. When this mixture has cooled to approx 155° begin pouring the second layer. Fill approximately 1/4”. Allow layer to cool. This layer will cool fairly quickly so keep a close eye on it. Set the pour pot on the digital scale and tare. Transfer 4 oz* of wax, and add .4 oz of Rustic Escentuals Watermelon Fragrance Oil** for the final layer. 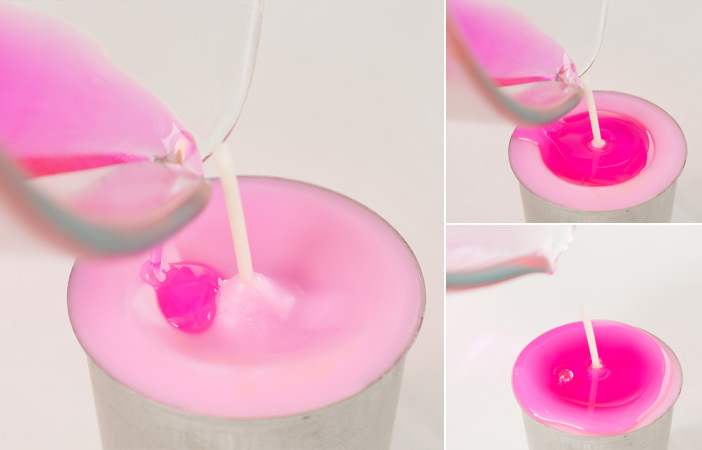 Stir well (approx 2 min), then add 1 drop of Rustic Escentuals Pink Liquid Candle Colorant. Stir well. If you want the votives to have more of a red tone, dip a bamboo skewer into a bottle of Rustic Escentuals Red Liquid Candle Colorant and stir into the melted wax – this will add a deeper color to the votive candles. When this mixture has cooled to approx 155° begin pouring the final layer. Fill to where the votive mold begins to flare out leaving room for the re-pour. Allow layer to cool. When the wax has finished shrinking, do the re-pour. Fill all the way to the brim of the votive mold making sure not to overfill. Let the candles cool completely. 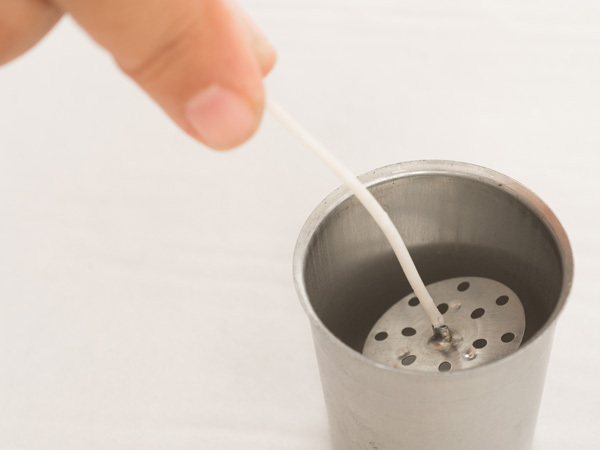 If they don’t fall out by simply inverting the mold, give the metal votive mold a firm, quick tap on a sturdy surface — this should loosen the candles and then they’ll fall right out. Trim the wick to 1/4”. 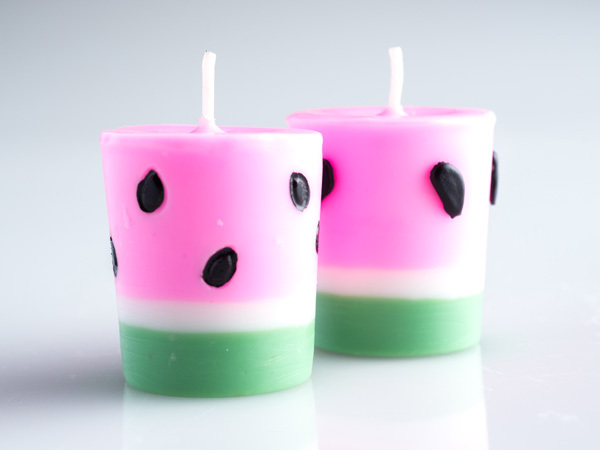 For a cute decorative touch: create watermelon seeds using black wax. 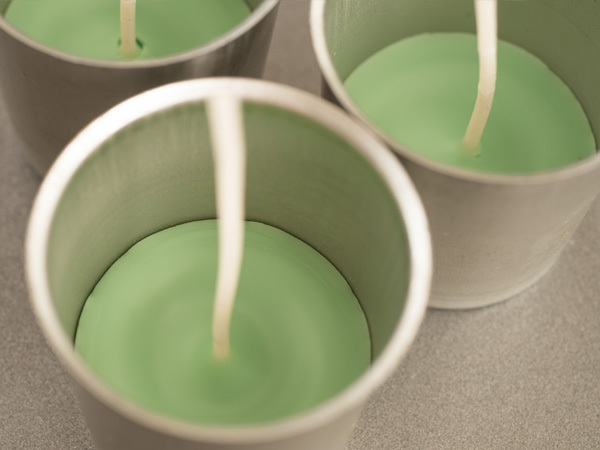 Drip a little on a piece of wax paper, peel off and adhere to the side of the candle with non-toxic glue. 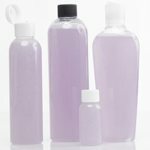 ** Wax, fragrance & colorant selections in this tutorial are for demonstrative purposes only.